The ideal racing surface requires 4-12% moisture to achieve natural binding for shear and load bearing strength required by the horse. Simply put a damp soil consistency. 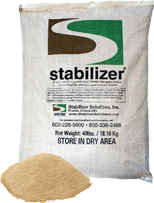 Stabilizer Water Binding Technology keeps your track's ideal moisture content window open longer. It binds water and soil particles, maintaining stability during rain and releasing moisture into the soil or sand when dry. Combined with StaLok® Fiber, which gives three dimensional strength and stability to sand and soil, the Stabilizer Racing Surface has shown the safety of a synthetic track, while allowing for traditional track management methods. Absorbs 12 X its weight in water. Maintained similarly to traditional tracks, eliminating temperature fluctuations from synthetic tracks. After initial installation only small amounts of amendments are added year by year.